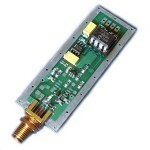 RF Power Head Sensor Kits suitable for measuring low level RF power from DC to 7GHz. These can be used either with a DC Multimeter for simple RF power measurement, or with our DDS-VFO Kit using SWEEP software as a complete Power Meter solution. The DC to 500MHz RF Power Head Kit uses the AD8307 Logarithmic amplifier, and can ei.. The 300MHz to 7GHz RF Power Head Kit uses the LTC5508 Logarithmic amplifier, and can ..